Do you feel like you’re putting yourself out there, but people aren’t really gravitating towards what you’re saying? Maybe because you need to niche down. 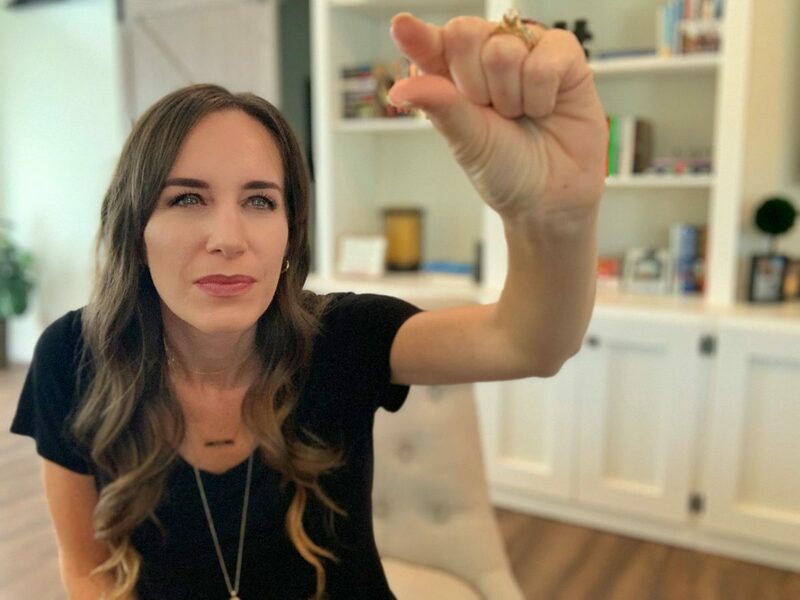 In this video, I’m going to show you two niche marketing examples from a specific client and how two media hits with two totally different niches made all of the difference. It’s no secret that a big media hit is super impressive and it can do wonders for your business, but sometimes a media outlet is so big that it’s actually not very niched and a lot of people watching or reading or listening to that big outlet isn’t your perfect audience. They’re not the right avatar because of the size of that outlet. Sometimes niching down, while you may think it’s less impressive to people on the outside, it’s where you’re going to see a lot of ROI and where you’re actually going to make your money. I’m going to show you, in this video, exactly how that happened to one of my clients. One of the media hits that we earned them was huge. Millions and millions of people were watching it on national TV. Another outlet, much smaller but much more niched, is where they saw a bigger ROI. Now, there are some numbers involved here, so I’m going to go to a powerpoint presentation so I can make this super easy to follow and digest. So, let’s start with Today. My client got coverage on the Today Show. As you can see, tons and tons of people were watching the Today Show, and we’re going to follow this path and go with conversions. If a certain amount of people watching this converted, how would that end up for the client? So we’re gonna go through the Today Show first and we’re going to be super conservative and use a terrible conversion rate just so you can see how amazing media coverage is. But, I also want you to pay attention to this niche marketing example and how it works out. So for example, with the Today Show, we have a few million people watching it. 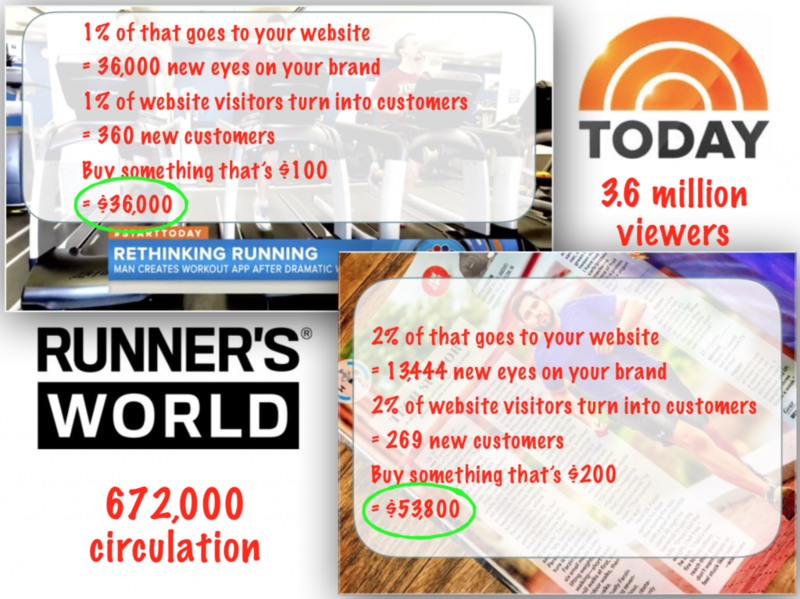 We’re going to use a terrible conversion rate and say only one percent of people watching actually went to the client’s website… and we’re going to do this because the client has an app in fitness, running specifically, and I bet there are a lot of people watching the Today Show who just don’t like to run. Maybe they hate running. They’re not runners so they’re not going to convert. So one percent go to the website. From the website, one percent of people actually see something they like and pretend they ended up paying for a membership, or they buy the App, or they buy a personal training session for $100. This is how much money that client would have made on the Today Show hit. But now let’s get more niched. Because remember, not everybody watching the Today Show is interested in running, so let’s go to Runner’s World and this was actually the client’s number one goal because remember they are niched in running. So I think it’s safe to assume that everybody reading Runner’s World likes to run. So we’re going to ignore how many people go to the Runner’s World website, which is a huge number. We’re just gonna focus on the magazine circulation and because it’s more niched, we’re going to use another terrible conversion rate, but still a little bit higher than the Today Show at two percent. So say two percent of the people who saw this article in Runner’s World went to my client’s website. Of that two percent that visited the website, two percent of them ended up purchasing something that came out to $200. So as you can see, when we go with a more niche marketing example, we are seeing a bigger ROI and we’re making more money. While everybody knows what the Today Show is, not everybody knows what Runner’s World is. 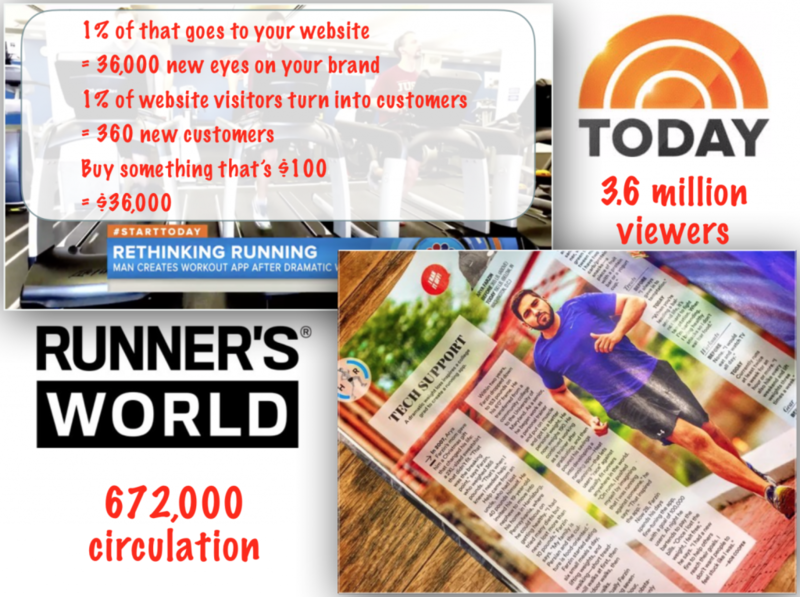 Runner’s World is where you’re going to get a bigger bang for your time… and I don’t say buck because remember, these are earned marketing examples. For more earned media examples, check out my video where I actually walk you through step by step how we earned another client coverage on local TV. I know it’s hard for a lot of people to niche down because they see something like the Today Show and they’re super impressed, but I’m wondering how niche can you go? Instead of saying you work with business owners, maybe you work with business owners who are only women, who are making $250,000 or less, and who live in south Florida. That’s a lot more niche than business owners and it will help with your targeting to actually get in front of them. Now, obviously, the Today Show publicity helps this client. It’s huge. It means so much for credibility and authority for getting in front of so many people, but you also want to include the niche marketing in addition to the more general marketing because they all work together. There is so much overlap that can help you and this gives you so much content to promote on your website, on your social media, on your LinkedIn page if you’re business to business, so this is a great way to think about it. The more general and the more broader the outlet, that’s great for longterm ROI, but the more niched that’s great for short term ROI and it’s a good idea to mix both marketing strategies. So I helped this client earned coverage on the Today Show and in Runner’s World. Now think to yourself, what would this do for your business? If you’ve got coverage on the Today Show or something more niche where you saw an ROI faster. I can help you get in front of them in a free three-day media class. It’s called Pitch, Publicity, Profit, and it will teach you exactly how I got that client coverage on the Today Show and how I got that client coverage in Runner’s World from the pitch to earning the publicity and then, of course, to see a profit from it. So make sure you check it out by clicking here. If you liked this video, please let me know by giving it a thumbs up and subscribing because I posted videos just like this one every single Thursday… and don’t forget niche down and letting me know how niche down you can go in the comments on YouTube.